You can also download the diagram as OmniGraffle file. It’s almost perfect because I think the HTML is misconceived in the diagram. “The section element represents a generic section of a document or application. A section, in this context, is a thematic grouping of content, typically with a heading. 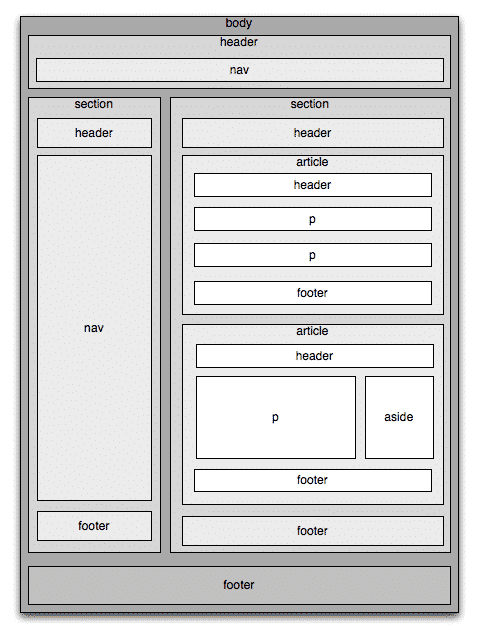 The section element is not a generic container element. When an element is needed only for styling purposes or as a convenience for scripting, authors are encouraged to use the div element instead. A general rule is that the section element is appropriate only if the element’s contents would be listed explicitly in the document’s outline”. Authors are encouraged to use the element instead of the element when the content is complete, or self-contained, composition. The element is not a generic container element. When an element is needed only for styling purposes or as a convenience for scripting, authors are encouraged to use the element instead. A general rule is that the element is appropriate only if the element’s contents would be listed explicitly in the document’s outline. Authors are encouraged to use the article element instead of the section element when the content is complete, or self-contained, composition. The section element is not a generic container element. When an element is needed only for styling purposes or as a convenience for scripting, authors are encouraged to use the div element instead. A general rule is that the section element is appropriate only if the element’s contents would be listed explicitly in the document’s outline.